Stay connected to CPR while you're on the go with the Colorado Public Radio app. This app gives you access to all three CPR services: CPR News, CPR Classical and OpenAir. Get the latest Colorado news, including Podcasts of “Colorado Matters,” listen to live music streams and browse the playlist to learn more about the music you heard. For the faithful CPR fan, there’s even built-in timers and alarms so you don’t have to miss a minute of Colorado Public Radio. 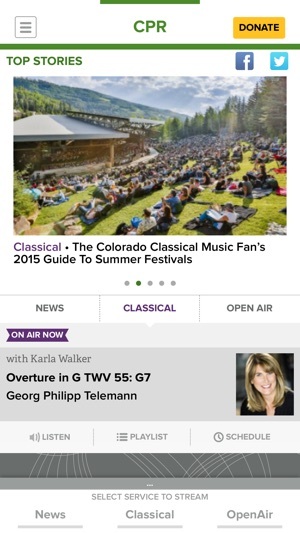 Colorado Public Radio is a community resource keeping you informed with in-depth news and music discovery. I’ve listen to CPR classical in the background almost every work day for the last several years. While I am glad that they are expanding and strengthening their signal, it seems to be at the expense of quality of their app. For the last several weeks, their music stream cuts in and out. This can be for several minutes or permanently to where I have to close and reopen the app. Sometimes it even repeats a few seconds of music when it finally resumes. It’s very disruptive and annoying enough that I’m starting to switch to NYC or LA’s public radio classical apps. This app works fine for streaming KCFR, but its user interface wastes most of the screen space. The volume slider doesn’t work. And most annoying, it runs as a full screen app which means it suppresses the status bar at the top of the screen — in particular the time and date is hidden. Adding insult to injury, there is so little actual content on the screen that this is completely unnecessary. This is an easy thing to fix, so please release a new version that at least fixes this one issue.